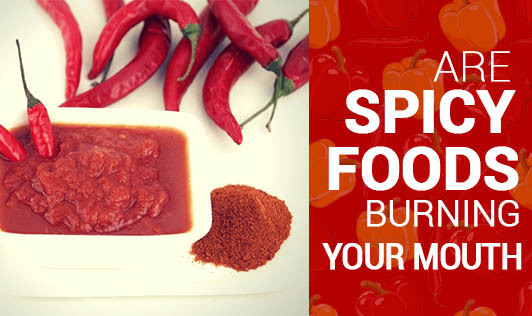 Are spicy foods burning your mouth? If you have ever had spicy food, you must have most likely felt like your mouth was on fire. The extreme burning sensation is caused by a chemical irritant called capsaicin found in chilies and it can last for a jiffy or may be hours. The only thing we all look for to cool the spicy feeling is water. . But, here are 5 other ways to cool down your mouth from spicy foods. 1. Have a glass of milk- When it comes to getting relief from a burning mouth, dairy products, especially plain milk, works best. It is seen that casein from the milk breaks the bonds formed by capsaicin on nerve receptors and gives instant relief from the heat. 2. Drink alcohol- Now, all you alcohol lovers, before you begin ordering drinks, let me tell you that alcohol only gives temporary relief from the burn. This is because oil and water don't combine and hence alcohol fails to scale back the effect of capsaicin. So as to reduce the effect of it fully, one may need to take too much alcohol, which is not recommended. 3. Sugar & honey- Sugar and honey are seen to absorb the spicy oils and neutralize the heat. 4. Eat a chocolate- A chocolate bar always comes in handy to reduce burning sensation in your mouth. The high fat chocolate easily removes the fat soluble capsaicin and gives you relief from the heat. 5. Eat a slice of bread- Bread soaks up the oily capsaicin and gives you relief from mouth burn. Rice is also seen to help, but it is less effective as it soaks less oil due to its grainy texture. The next time you're thinking of getting some very spicy food, make sure you have these foods handy.